Every previous entry in this series has followed a pretty similar path: after returning to a game I previously didn't enjoy all that much, I discovered it really wasn't so bad after all! This one is going to be different. Now, that doesn't mean I'm going to declare at its end that I still dislike the Famicom port of Rainbow Islands even after giving it a second chance, but it also doesn't necessarily mean I'm going to say that I'm now madly in love with it. In reality, my current opinion of this 8-bit conversion of Taito's classic arcade game, the only official sequel to the company's Bubble Bobble, is that it's a hit-and-miss affair. On the one hand, for instance, its protagonist and enemy sprites are pretty darn nice, especially when you consider the Famicom surely pales in comparison, power-wise, to the arcade PCB. As for what's keeping me from enjoying this installment as much as I enjoy, say, the pretty-much-arcade-perfect PC Engine one: a particularly noteworthy example, I think, is the limited color palette that's used here. Although the game's sprites look great, its backdrops often appear drab or washed out. 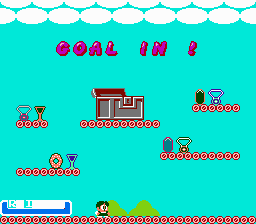 A few other reasons this Rainbow Islands port doesn't exactly stack up to its arcade or PC Engine brethren: the ever-present and action-obscuring flicker, the subtly altered gameplay (protags Bubby and Bobby can only shoot a maximum of two rainbows here, as opposed to the three that can be spawned in other iterations) and the screwed-up stage layouts. That last negative is the most damning, if you ask me, as some of the level-design choices that were made during the production of this port are head-scratchers. 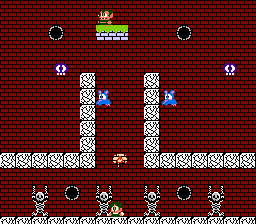 Case in point: a number of stages now have spike-lined platforms that aren't, as far as I'm aware, present in other versions and that make progressing through some of the levels in this one to be an annoyingly difficult chore. Even when stages aren't hampered by spike-lined platforms, though, they're often hamstrung by other obstacles--all of which conspire to kill the flow that I consider to be a hallmark of the arcade and PC Engine versions. As such, while playing the Famicom cart it's nearly impossible to get into the same kind of grin-inducing "zone" that makes those other iterations so enjoyable, and that's a shame. To those of you who've also spent some time with Rainbow Islands' Famicom (or even NES) outing: what are your thoughts on it? Worth it all for that boxart alone! 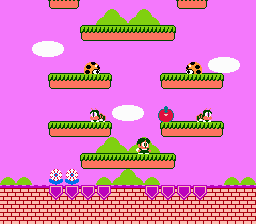 Rainbow Islands is probably my least favorite of the original Bubble Bobble trilogy, and the dull color palette of the NES really hurts the game's appeal. That was also an issue with the NES version of Bubble Bobble, where all the vibrant hues lost a lot of their luster. Oh, yes, the dull color palette of this version definitely hurts it quite a bit, Jess. And although I agree that Bubble Bobble was similarly impacted (in a negative fashion) when it was ported to the Famicom/NES, I think that resulting product was far better than this one. I dunno... Rainbow Islands doesn't have the same hook that Bubble Bobble does, in my opinion. I haven't played the Turbo version (wasn't even aware one existed! ), but played it on the Genesis recently, and used to own it on the Saturn. That version was on a disc along with a (surprisingly crummy) port of Bubble Bobble. Parasol Stars suffers from the same overstuffing as Gaplus, the sequel to Galaga. There's just too much going on, and it's hard to keep track of it all. Despite that, I'm drawn to the colorful artwork and all the items you can collect. The Bubble Bobble series in general does a really good job of scratching that hoarder's itch, throwing huge piles of goodies at you at any given moment. Parasol Stars is even more generous than the previous two games, with chocolate bars, martinis, and who knows what else packed into every stage. You could say the same about Parasol Stars, really--that it doesn't have the same "hook" as Bubble Bobble, I mean--but I understand what you're trying to say all the same. Also, although Parasol Stars' hook differs from the one found in Bubble Bobble, they're similar enough to be thought of as being related to one another, I think. Rainbow Islands is a lot deeper and more intricate than BB and PS, if you ask me. I mostly view that as a good thing, but it also means the game is less accessible and also more prone to being difficult or aggravating. As for the PCE port of Rainbow Islands, it's a JP-only release and was on CD. It's basically arcade perfect, as far as I can tell. Oh, and for what it's worth, despite the fact that I *want* to like the Mega Drive port of Rainbow Islands, I've been unable to come around to it, even after spending some quality time with it recently. There's just something off about the way it feels--specifically, about how jumps feel. I don't know if something was changed when it was ported or if this is how the "Extra" version felt in the arcades, too, unfortunately.